Task<TResult> if your method has a return statement in which the operand has type TResult. GetStringAsync returns a Task<TResult> where TResult is a string, and AccessTheWebAsync assigns the task to the getStringTask variable. The task represents the ongoing process for the call to GetStringAsync, with a commitment to produce an actual string value when the work is complete. 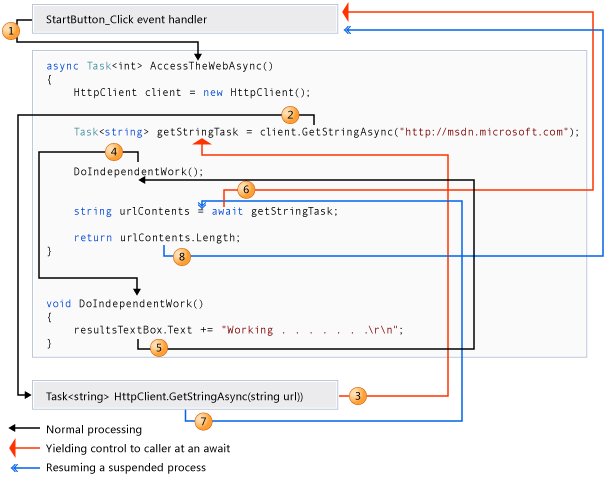 Inside the caller (the event handler in this example), the processing pattern continues. The caller might do other work that doesn't depend on the result from AccessTheWebAsync before awaiting that result, or the caller might await immediately. The event handler is waiting for AccessTheWebAsync, and AccessTheWebAsync is waiting for GetStringAsync. You might be wondering where to find methods such as GetStringAsync that support async programming. The .NET Framework 4.5 contains many members that work with async and await. You can recognize these members by the "Async" suffix that’s attached to the member name and a return type of Task or Task<TResult>. For example, the System.IO.Stream class contains methods such as CopyToAsync, ReadAsync, and WriteAsync alongside the synchronous methods CopyTo, Read, and Write. In .NET Framework programming, an async method typically returns a Task or a Task<TResult>. Inside an async method, an await operator is applied to a task that's returned from a call to another async method. You specify Task<TResult> as the return type if the method contains a Return (Visual Basic) or return (C#) statement that specifies an operand of type TResult. The following example shows how you declare and call a method that returns a Task<TResult> or a Task. Shows how to bridge between Task types in the .NET Framework and IAsyncOperations in the Windows Runtime so that you can use WhenAny with a Windows Runtime method. Describes a new pattern for asynchrony in the .NET Framework. The pattern is based on the Task and Task<TResult> types.